Posted June 11, 2015 by Tobias Forrest & filed under Episodes. In our seventh visit to Game of Thrones this year, Jon and Tormund departed to the wildlings’ camp, Brienne continued to survey Winterfell and Daario’s marriage proposal was rejected by Daenerys. Elsewhere Diana Rigg and Jonathan Pryce continued to impress as Lady Olenna and the High Sparrow sparred over Margaery and Loras’ incarceration. Unsurprisingly, ‘The Gift’ sees a somewhat shaken Sansa as we catch up with her following her ordeal last week at the hands of new husband, Ramsay. After five seasons, Sophie Turner has become adept at imbuing her character with generous helpings of vulnerability in stark contrast to the self-important young girl we were introduced to in Season 1. 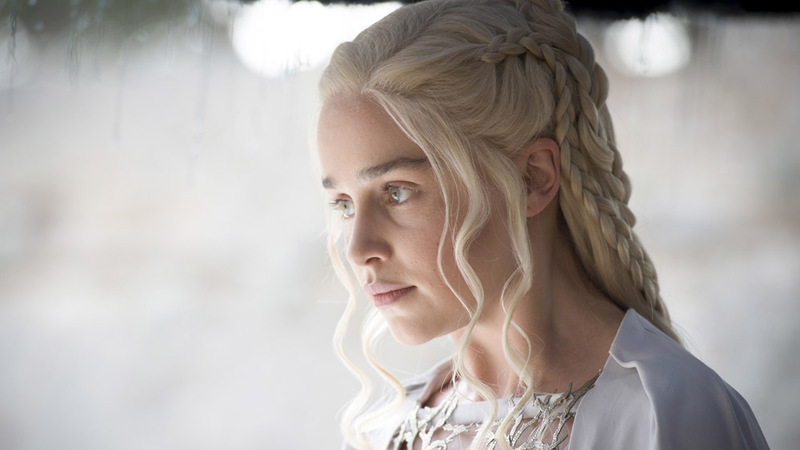 ‘All day I’m locked in this room and every night he comes.’ Years of hardship and cruelty have certainly taken their toll on the eldest Stark daughter and there doesn’t seem to be any reprieve for her just yet. In this episode, Sansa pleas for help from the only person who might just be able to provide it. It remains to be seen, however, whether Theon will break free from Ramsay’s control and aid Sansa’s longed-for escape. If Theon’s past behaviour is anything to go by, Sansa probably shouldn’t hold her breath. ‘The nights are so long now,’ remarks a particularly pleased-with-himself Ramsay who is fast becoming the most hated character on the show, yet you can’t help being drawn in by Iwan Rheon’s mesmerising performance and the many subtleties he brings to the role. Meanwhile at Castle Black, Sam led an emotional farewell to Maester Aemon whose death leaves Sam with one less ally to protect him from the more unscrupulous members of the Night’s Watch. ‘He was the blood of the dragon but now his fire has gone out.’ As with much of this season, these scenes were a major change to Maester Aemon’s original death in A Feast For Crows. Although it is understandable that certain alterations have had to be made, in order to streamline Martin’s mammoth-sized manuscripts, it is a shame that Benioff and Weiss have seemingly decided to abandon much of Sam and Gilly’s journey. 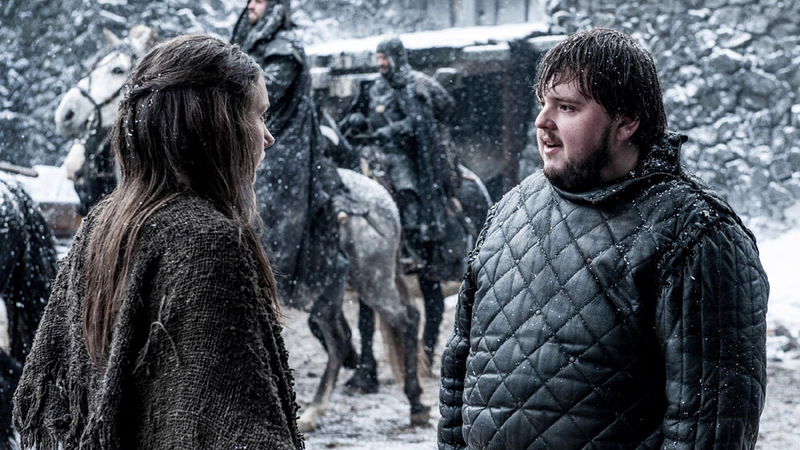 The fight between Sam and his attackers comes across as a cynical and forced attempt to bring Sam and Gilly together and is altogether less than the sum of its parts. How many times do we need to be reminded of the direwolves’ brute strength? Across the sea, Jaime unsuccessfully attempted to persuade Myrcella to return to King’s Landing and, in the Dornish cells, Bronn made use of his impressive singing voice. Unfortunately for Bronn it turned out that he had been poisoned and it seemed as if Westeros’ most happy-go-lucky citizen had met his doom. Mercifully for Bronn, and for us, an antidote was quickly provided and the sell-sword lived to fight another day. Over at Stannis’ camp the would-be King’s strength was rapidly failing as the bleak conditions threatened his army’s survival. ‘This the right time and I will risk everything,’ a particularly grim Stannis warned amidst Melisandre’s dark recommendation to sacrifice his only daughter, Shireen. Having already murdered his own brother, Renly, will Stannis choose ambition over family again? In Meereen, Jorah’s reunion with Dany did not quite go the way he hoped and Tyrion was finally introduced to the Queen he had journeyed far to meet. It seems strange to think that we’ve waited five years for Peter Dinklage and Emilia Clarke to share a scene, but it looks as if the wait might just have been worth it. 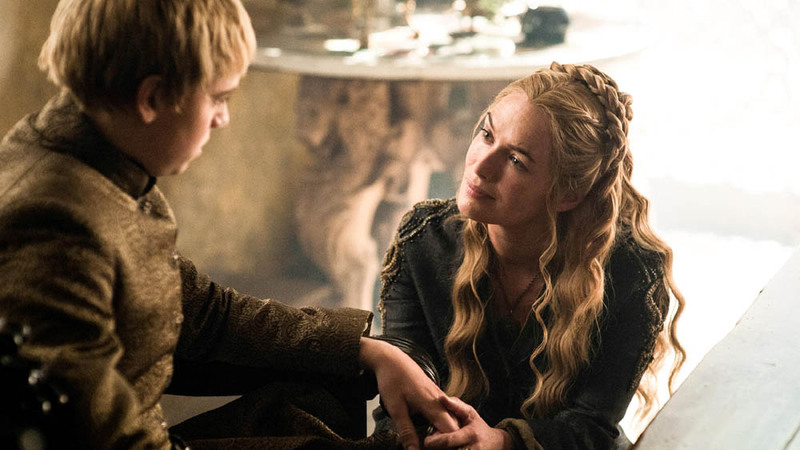 It was a triumphant moment in King’s Landing this week as the High Sparrow turned on Cersei following her smug taunting of Margaery as the young queen languished in her cell. ‘What will we find when we strip away your finery?’ Jonathan Pryce once again manages to own the screen with very little to do and there is a sense of overdue satisfaction as the bitter Queen Regent is led away to her very own cell. Although it is doubtful that Cersei will be taking this lying down. Elsewhere in the capital, Littlefinger and Lady Olenna discussed their involvement in Joffrey’s murder. ‘You’ve always been rather impressed with yourself, haven’t you?’ Lady Olenna remarked; a sentiment I can’t help sharing as the fantasy drama’s fifth season meanders towards its conclusion. Like so much of this season, ‘The Gift’ was an uneven episode that too often tries to replicate the heights of previous years and never quite reaches them. Aired at 9pm on Monday 25 May 2015 on Sky Atlantic. > Buy the complete Season 1-4 boxset on Amazon. > Follow Tobias Forrest on Twitter.